= Yukari mata ukkari misu ga attayo. = Yukari, you made another careless mistake. I have been giving my Twitter followers a daily quiz. The other day, I gave them a translation exercise, and they didn’t seem to know some of the words. Today I’ll make lessons out of the key words. = Misu ta ippai aru. = There are a lot of mistakes. うっかりミス ( = ukkari misu) is a careless (thoughtless) mistake. = Ukkari misu wo nakusanai to ikemasen! = You have to prevent making careless mistakes. = Kore wa ukkari misu da. = This is a careless mistake. = Juuyouna shigoto dakara kuregure mo misu no nai you ni. = This is a very important job so please be careful not to make any careless mistakes. 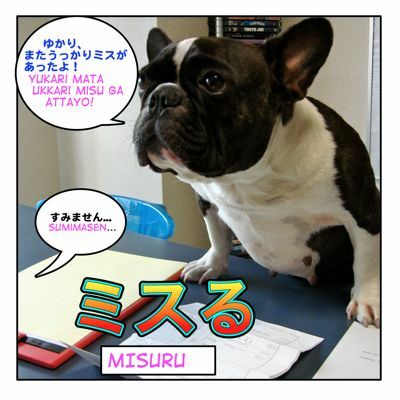 Now we shorten it and say ミスる ( = misuru) in colloquial Japanese. = I made a mistake at work. = Kyou wa boutto shiteite misutte bakarida. = I have been spaced out all day, and I’ve kept making mistakes. We have more coined verb like this. I will teach you some new ones. Are you ready? = Chotto torabutta node okuremasu. = I am having a little trouble so I’ll be late. = Keitai jibun de dekocchatta. = I decorated my cell phone by myself. to take a note, to write down !memomemo! = You don’t want to take notes? = Chotto memotte oku wa. = I will write it down. = Mou saishuu detakara takutte kaeru. = The last (train or bus) has already left so I will take a taxi home. We use it when we sing together. = You harmonized very well. = Kinou katta mono to onaji hon wo morattano. Dabuttakara issatsu ageru. = I got the same book that I bought yesterday. Since I have two now, I’ll give you one. = Kyou wa nukiuchi tesuto ga ari minna panikutteta. = We had a pop quiz and everybody panicked. These are not originally from foreign words but they are coined verbs as well. = Why are you so nervous? to confess, to tell someone that you love him/her for the first time. = Kanojo ni kokuttara kotowarareta. = I told her how I feel (for the first time), and she turned me down. = Ima jikocchattakara korekara keisatsu ni ikimasu. = I just got into a car accident, so I will go to the police now. = Aitsu ano toki kanpeki ni kyodottetana. = Kyou no ressun wa ikaga deshitaka? = How did you like today’s lesson? = Please take notes, OK? what’s the meaning of this? is formal speech? = Donna koto wo shite iru no desuka? = What do you do? / what do you do for a living? = Donna koto wo nasatte iru nodesuka? I just want to say “thank you” for making and keeping this Site. You are helping me improving my english and japanese. I am honestly wishing the “Maggie Sensei”-Team (and Maggie) the very best. Ohhhh Thank you so much for your nice comment!! Just to know that someone in Germany has been studying my lessons made my day. I will try to make more and more lessons!! Ich bin es, der zu danken hat. Is できる almost always interchangeable with 作る to mean "to make"? Like 友達を作る = 友達ができる (make friends)? As for the last question, できる and 作る are not always interchangeable. 友達を作る and 友達ができる are both translated as “to make friends” but できた has more feeling of achievement like “I got a friend”, “I could make a friend!”. You can’t replace 出来る with 作る here. but again when you say “出来た！” you show more feelings of achievement. Hi, Maggie. Im ella from tokyo. I saw your site on Google, ur blog is interesting and i want to improved my Nihongo. Hi, Ella! Thank you for visiting this site! Hope you come back here to learn more Japanese. We usually use うっかりミス as careless mistakes. “honest mistake”means “unintentional” mistake, right? So either way, Yukari has to pay attention more and shouldn’t make any careless mistakes. Because she always does. Thank you for visiting the site again! Haha! I have never heard them actually used but ハゲよう！ sounds funny! You can create your own word as well! Ex. マギる = magiru! = to go visit Maggie Sensei’s site! Thank you for teaching me new words! Hi Amanda! Thank you for checking the lesson! Hope you can use some of these verbs from now.